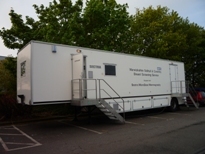 The City, Sandwell and Walsall Breast Screening Service is part of the National Breast Screening Programme (NHSBSP) and invites over 55,000 local women for screening each year. We provide a free breast screening service for well women aged between 50 and 70, resident in East and North Birmingham, Heart of Birmingham , Sandwell and Walsall PCTs. Information and advice for patients about the breast screening process is available in English as well as a choice of languages. Please click on the links below to download this information in your chosen language.